I have been messing around with the new Netflix iPhone app for about a week now. My initial impressions are below. I don’t typically watch much video on my iPhone unless I am traveling. Since Netflix requires a network connection, I figured this service wouldn’t fill the important “bored on an airplane” need, and consequently be of little use. With that in mind, I was a bit curious to see if I would actually use the app. As it turns out, it’s been great. I share a TV with my wife and young daughter. My viewing preferences often conflict with theirs. Last night while my wife was watching cooking shows, I watched a documentary on the Rolling Stones. I could have done this on my computer of course, but I sit in front of a computer all day at work, and don’t really care to be desk-bound at home. I took my documentary outside and watched by the pool. Later, I watched Black Adder in bed, then in the bathroom, then outside while walking the dogs (OK, I was just listening to it at that point). I’ve never had this kind mobility before! It’s also been nice to have a huge library available instantly, wherever I am. A friend sent me a few Big Lebowski quotes at work the other day. 90 seconds later I was watching the film on my iPhone. (Netflix is blocked on my work network). I could get used to this. Pretty well actually. It takes me a few seconds longer than I’d like to get the browser up and loaded, but I am still poking along on a crippled iPhone 3G w/ iOS4, so that’s probably the culprit. The search function works quickly, and my instant queue loaded right away as well. As far as the playback, I’ve not had much trouble watching video on either wireless or 3G, which actually surprised me. I found that hitting pause for a few seconds at the outset built up enough buffer to keep playback smooth. I even started a movie at home, left it on as I got in the car and drove to work. I had one little skip in the middle, but otherwise, it kept right on playing, suggesting a further use of the app; piping emergency road-side Elmo videos to a fussy passenger. When I leave the app, it remembers where I stopped a film, and picks right back up when I come back. The video quality is fine for me. I’m sure some folks would like it to be better, but if Hi-Definition is really important to you, you’re probably not going to be watching stuff on your phone anyway. Streaming video on 3G does kill the battery (especially since my iPhone is almost 2 years old). 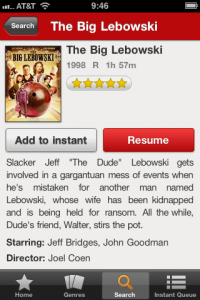 I’d like to be able to manage my Netflix DVD Queue in the app (yes I still watch those). I currently have to use a different app for that, or *gasp* my computer. I don’t expect that I’ll be using the Netflix iPhone app every day, but it certainly looks like it will be a useful alternative to the cumbersome process of loading video to my iPhone, or the expensive process of buying video from iTunes. hmm, that is interesting. I didn’t think i had too much of a use for this, but i guess since i watch tv/movies 24×7, may as well wire it in for portable use! What app are you using for your Queue? I’ve been using PhoneFlicks, which is VERY basic. the queue management is ok, and its got a few canned lists to Browse through by genre’s and Popular lists, but they don’t seem to be paginated, so I can’t go that far back into “New Releases” for example. With the launch of the beefier iPhone/iOS4, I’m sure Netflix rushed to get something out, and had to pick and choose which features to include. I am guessing Netflix decided to go with the streaming first because that was the main differentiator over the other apps. They definitely couldn’t have release just another queue app, assuming they had to focus their resources. (Or maybe I’m just jaded from my own job.) Just wait for the next version.